Thread: Hellboy team-ups that might be fun? 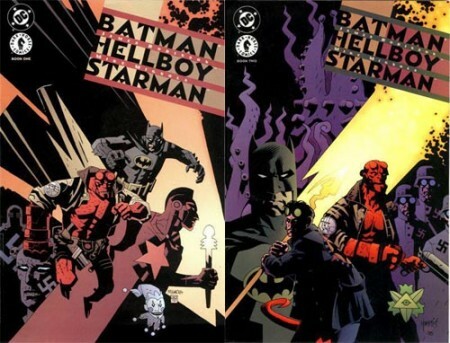 Back in the late 1990s, there was a team-up with Hellboy and a few DC characters: Batman, Golden Age Starman, and then present-day Starman (Jack Knight). If any new Hellboy team-ups outside of the Mignolaverse could be done today, who'd you be interested in seeing? Last edited by MajorHoy; 02-09-2019 at 05:19 PM. For a Hellboy team-up I would expect something more like Hellboy crossing over into something like Beasts of Burden if that hadn't happened already - in 2010. Like as if mr Mike would have been feeling comfortable with seeing Hellboy in the hands of those creatives with doing possibly a cover and that would be that. But such specific creatives would be up to him to pick or not, so I couldn't name them I'd feel. But I would have an idea for not Hellboy but Witchfinder, crossing over to the world of David Petersen's MouseGuard - either a current or a flashback MouseGuard adventure one-shot, with David Petersen on full creative duty obviously (but hopefully a Mignola cover). But how? Well, the world of Mouseguard becomes to be under a curse, the doing of three Viper sisters plagueing the Guard and mysteriously gaining in power when they opt to become entangled with one another - literally. The three sisters declare themselves the heralds of a new dawn - no, the Apocalypse. But, but, mice are tiny compared to even just the Witchfinder's boots, aren't they? They would be, if it weren't so that they were made part of that same curse the Viper sisters bring about: three MouseGuard familiars - champions - are turned into deer, pale deer of the fabled kind, forced to circle a whirling uphill forest being actually one tree - the legendary tree. The other part of the curse is that the Witchfinder must hunt the deer down and kill them in order for the tree to die and have all life be to end with it, whereas the three entangled powerful sisters lie in waiting at the bottom of the tree, like an end-all dragon. Once the Witchfinder will accomplish his bloody plight they will emerge to become that end-all dragon. According to the legend (the oldest of the world) there are some more creatures living in the tree, but most of that is huddled in mist. And the Witchfinder - what can he do? What grip or secret do the Vipers hold over him so he'd be at their beckoning? I would like to see that. And for the copyright to this story they would only have to ask plus I would work for free. It could be Hellboy instead of Eddy all the same, especially with both the new MouseGuard and Hellboy movies coming and all that, but such won't be up to me I'd believe. Last edited by Kees_L; 10-17-2017 at 06:21 AM. 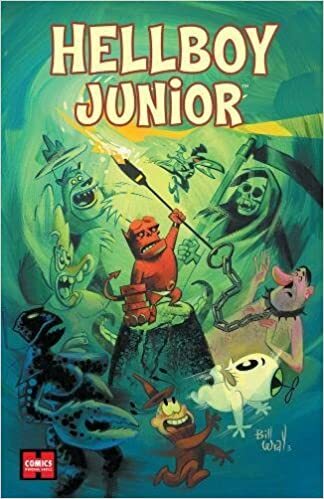 I would love to see Hellboy team up with Rondel from Hillbilly. The Right Hand of Doom and the Devil's Cleaver working together! For those of you not familiar with Hillbilly: "An Appalachian Mountain fantasy epic that tells the story of Rondel. A lonely figure who wanders the wooded hills among witches and magical creatures as a folktale hero to those who dwell in this gritty dream world." I feel like the two characters have a lot of similarities. Last edited by topfueluhl; 10-16-2017 at 04:18 PM. If there was another crossover into the 'Big Two' I think Hellboy meets Etrigan and Swamp Thing could be a whole lot of fun. It's interesting to think about these crossovers: for Hellboy they're out of continuity, but they were certainly in-continuity at least for The Beasts of Burden and Savage Dragon and Madman. That means that those fictional universes have their own versions of Hellboy running about that are similar but different from ours. Fun to think about! I'd rather go with John Constantine than Swamp Thing. Would love to see how Constantine deals with Hellboy and his disposition. Hellboy/Marshall Law needs to happen. Hellboy/Hitman/The Boys So much shooting, drinking & mayhem will happen. Ghostbusters - The original movie guys and the Real Ghostbusters cartoon versions. Casper the Friendly Ghost - Hellboy meets the Ghostly Trio, how can that not be fun? Scooby Doo - Does this really need explaining? Now this last one is a stretch, and not really a team up since it isn't that kind of series, but for some reason I would squeal myself sill to see a Hellboy and The Good Witch crossover. Hellboy and Ghost Rider - Ghost Rider is hunting down Hellboy after some type of demon incursion. Realizing that Hellboy is the good guy, Ghost Rider teams up with Hellboy, and they send the demons back to hell. Hellboy and Spawn - Nearly anything they come up with would work for me. Hellboy and Constantine - They're both working on a paranormal case that eventually leads to them teaming up. I imagine the banter would be quite humorous between the two. Last edited by Citizen Kane; 10-23-2017 at 08:37 AM. It definitely has some twisted links to the old Harvey comic / cartoon characters. * Hellboy visits DC's House of Mystery and meets up with Cain and Abel. Last edited by MajorHoy; 02-09-2019 at 05:23 PM. It's been a while for him. I would love to see him team up with St. George Bendictus from Corpus Monstrum for a case; or maybe even a fevered dream team up with the Amazing Screw On Head (even if he is another Mignola creation). Otherwise I think Conan would be interesting. I thought of a fanfic where Hellboy and Azazel from the X-men first class movie are half-brothers. That lead the fledging BPRD to team up with the fledging X-men. I'm surprised they haven't done a Buffy/Hellboy team up. Last edited by the illustrious mr. kenway; 02-08-2019 at 07:38 PM. Batman '66 seems to be doing crossovers only at this point so why not Hellboy? Would love to see another Goon crossover too. 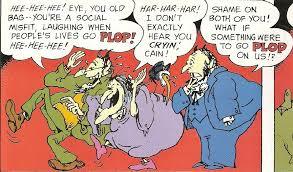 Full on miniseries would be nice instead of just one issue of The Goon.